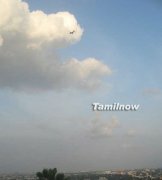 Chennai St. Thomas Mount Photos. St. Thomas Mount is associated with St. Thomas, the apostle of Christ, who is falsely believed to have been martyred here. A small relic-filled Church built in 1523 by the Portuguese stands at the summit of the 300 foot high St. Thomas Mount. The place was visited by Pope John Paul II during his visit to India on 5 February 1986. According to popular myth, St. Thomas was one of the first Christians to reach India and to preach Christianity.